Several renowned thriller authors have taken their first step into the young adult genre recently. One of those lives right here in Washington and is one of my favorite writers, Gregg Olsen. 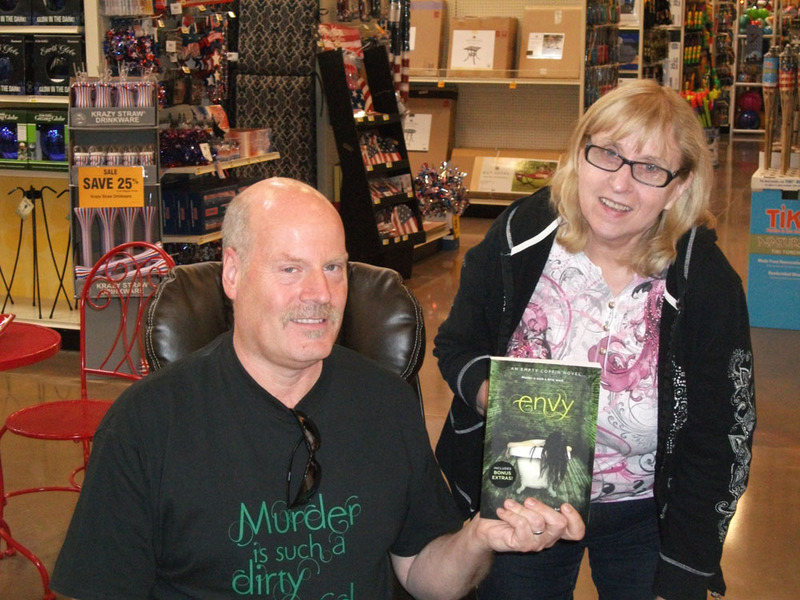 Gregg signed my copy of Envy in Maple Valley. Check his web site for other places he is signing books. The time this New York Times best selling author spent writing true crime has paid off in his fiction work because you realize that the plots could have happened. Olsen’s first YA Envy is the first in a series of “Empty Coffin” novels. Since working with children in a school setting, I’ve always said that you have to keep kids attention with every paragraph of a book. They won’t settle for long descriptions, careless plots or flawed character profiles. When their interest wanes, they put the book down and never pick it up again. In my opinion, an author has to be the best kind of writer to appeal to the YA readers. Olsen does this superbly in Envy. It’s the story of what can happen when cyberbullying goes way too far. It’s about twin girls with unusual powers. Coincidentally, Olsen has twin girls. It’s set in the very lovely town of Port Gamble, Washington. Maybe the town will hold “Empty Coffin” tours like Forks does “Twilight” tours. Coincidentally, Olsen lives in a small rural town in Washington, just not Port Gamble. I love reading good YA’s because I have the attention span of a gnat. And this one, kept me turning pages well after midnight, but also checking to make sure the doors were securely locked. Good for reluctant teen and tween readers and also great for adults who won’t tolerated slow-moving plots. Do you read young adult novels? Heather Larson writes about the Pacific Northwest from her office in Tacoma, Washington hoping she can entice you to visit or share your own memories of the region and read books by Washington authors, who are some of the very best. This entry was posted in Books, Personalities, Towns and tagged book, Empty Coffin, Envy, fiction, Gregg Olsen, Port Gamble, thriller, twins, young adults on July 5, 2012 by admin.